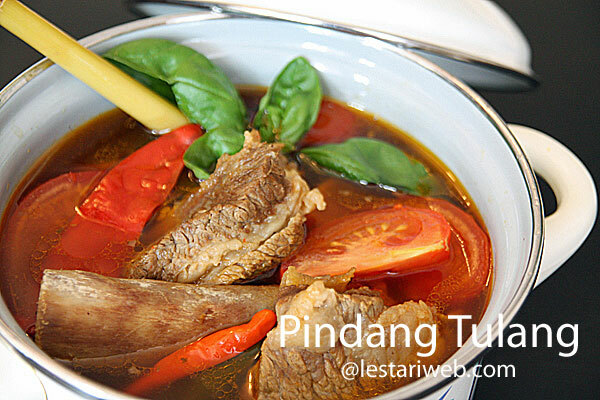 Meat & Bone (Spare Ribs) Soup is a one of the specialty dish of Palembang, a capital city of South Sumatera Province. But in nowdays you can find this dish almost everywhere across the country. I've came acrossed this dish about seven years ago when I was still working in one of multinational company in Batam Island - Indonesia. As I remember once I've had it with friends as a late lunch during our tremendeous workload day. It was really good choice though ;-). It tastes really superb, just a perfect combination between sweet, sour and spicy ;-) Thx and credit goes to Liza for sharing this recipe. 1Put all ingredients for the paste in a blender or food processor and blend until smooth. (If necessery add a little bit water to help the blending process). 2Pour in 1.5 liter water in a deep saucepan, cover the pan and bring to boil. 3Adjust the heat into medium, *** add the beef meat / spare rib and cook until half cooked. 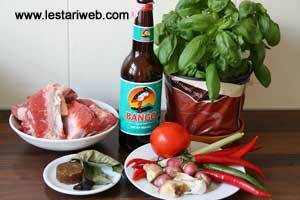 *** Add the meat into boiled water then cook on the medium heat to preserve it's best taste. (If necessary skim off and discard the fat that floats to the water surface). 4Add the paste, lemon grass, salam leaves, ginger, galangale and bring the whole mix to boil again. 5Consecutively add the chilies, kecap manis, brown sugar and tamarind water. 6Adjust the seasoning, add the salt and sugar to taste until it tastes sour, sweet and spicy. (If preferred you can add 1 tsp broth powder). 7Add the sliced tomatoes and sweet basil. Remove from heat. 8Young Manggo/Ananas Sambal: Grind the chillies, roasted shrimp paste and salt in a mortar until smooth. 9Add the chopped young manggo / ananas on it. Ready to serve. 10Serve the soup with rice and manggo/ananas sambal ( if preffered).